Plenty of Walks in Glasnevin! One of the drawbacks of living in Glasnevin is that there are so many beautiful walks in the area, one may never want to go anywhere else. Glasnevin amenities include the National Botanic Gardens, the National Cemetery, the Tolka River and the Royal Canal. Walks radiate from here to Ashtown, Finglas, Ballymun, Fairview, Drumcondra, Dublin Docks, Croke Park, City Centre, Phibsborough, Phoenix Park, etc. Dublin is said to be a city of villages (including Phibsborough, Finglas, Rathmines, Rathgar, Templeogue, etc). These were once separate entities until urbanisation joined them all together. 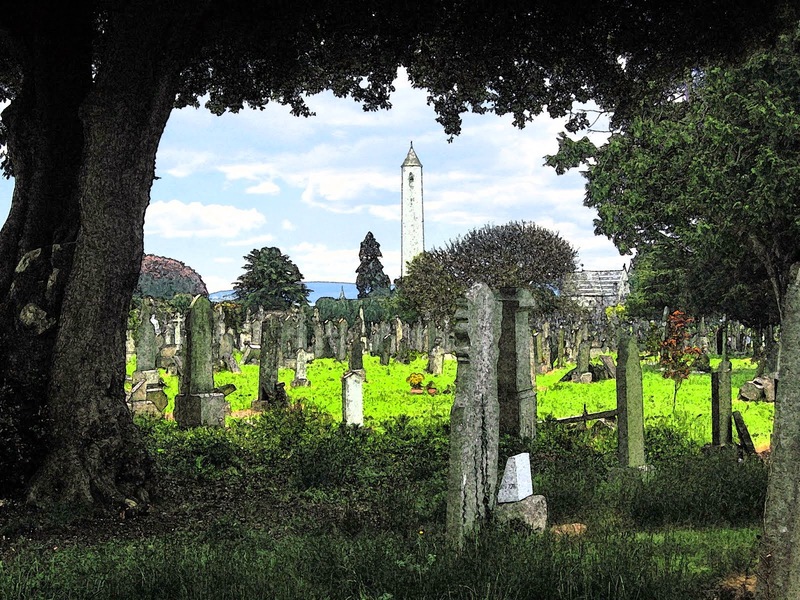 Glasnevin is one of those villages, now an inner suburb of Dublin. Originally, Glasnevin was a cluster of small houses, outside the estate now known as the National Botanic Gardens, beside the river Tolka. It was an Irish town, its residents being obnoxious to the anglicised folk of Dublin town. It sheltered rebels, vagabonds and miscreants. Nowadays, "Glasnevin" takes in a wide area stretching from the Royal Canal up to Ballymun. It is bounded on the north by Ballymun, on the south by Phibsborough and Cabra, on the west by Finglas and on the east by Drumcondra. It is not always clear where each of these begins. Glasnevin is not an administrative area, being served by Dublin City Council. Coming from town along the North Circular Road, and turning right (by way of a perverse detour if you are driving, for there is no right turn at Doyle's Corner) into Phibsborough Road, or, coming from the Liffey along Church Street, which continues as Phibsborough Road, you know you are in Glasnevin when you cross the Royal Canal at Cross Guns Bridge and see the Brian Boru pub on your left and Porterhouse on your right, two stylish structures, worthy of Glasnevin. (The same can't be said of Des Kelly's carpetdrome, this side of the Brian Boru, which is there for business, not beauty). The Royal Canal is the present boundary between Phibsborough and Glasnevin. However, the Royal Canal was built at the end of the 18th century, a relative new boundary. Before then, this southern section of Glasnevin, along with Phibsborough, was part of Cabra East. 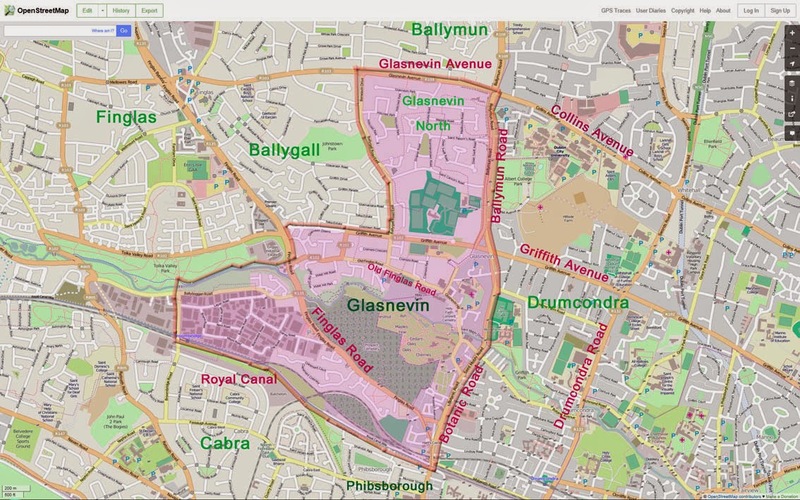 Administratively, this section of Glasnevin (Prospect Road, Finglas Road, Dalcassian Downs, Clareville Estate, Claremont Estate, The Willows and Violet Hill estate) is still officially in Cabra East Ward, though the designation has little administrative meaning. Our walks usually begin at the main gate of Glasnevin Cemetery - the gate directly in front of the O'Connell monument. This is just a matter of convenience for descriptive purposes, and the reader can choose any other starting point he wishes. landmark. 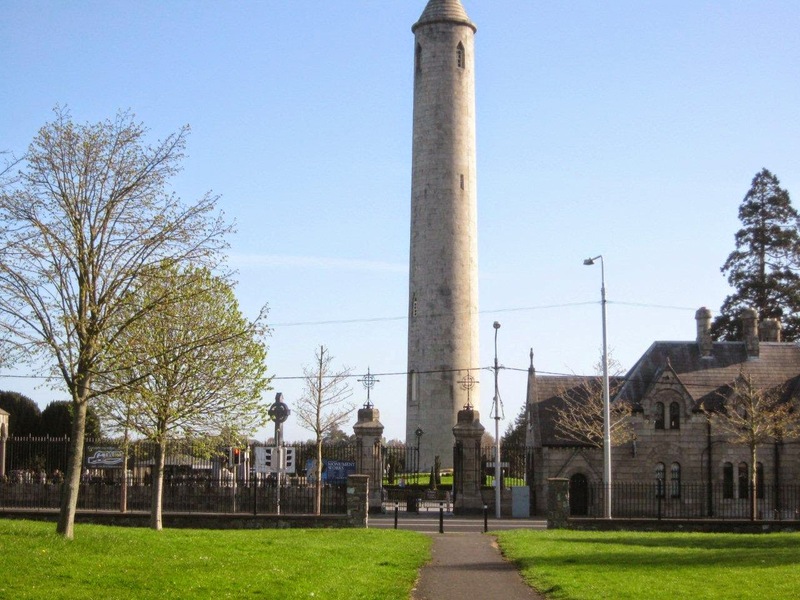 It has the shape of a round tower and was the highest monument in Dublin before the Spire in O'Connell Street. (Three monuments were being considered at the same time in the 1850s, one for O'Connell, one for Wellington and one for Nelson. The three committees all agreed that the monuments would be the same height. However, when the O'Connell monument was nearing completion, the scheming committee decided to add a few extra feet. Besides being the tallest monument in Dublin, it is also at the heighest point. From the top, when the stairs are re-constructed in the near future, there is a magnificent view stretching from the Cooley Mountains in the North to the Dublin Mountains in the South). To get here, take a 40, 140 or 40D Bus from O'Connell Street or Fingles and get off at "Finglas Road/ Claremont," which leaves you beside the starting point. Alternatively, take a 4, 9 or 83 bus to Hart's Corner, a three minute walk from our starting point. To the right of the main gate is the old Gate Lodge and offices and to the right of that a gate for motorised traffic, and then the book-shop, museum, new offices and café-restaurant. To the left is the Sigerson memorial, the sarcophages of some of the bishops of Ireland and the cemetery church. Across the road, you see the fine park and housing estate of Clareville. If you are meeting others, the Tower Café and Restaurant attached to the Cemetery Museum (to the right of the main gate) offers a suitable meeting place. Alternatives include the café of the Topaz petrol station across the road (a hundrred yards from the gate), or local hostelries such as the Grave Diggers (Kavanagh's), the Botanic House or the Brian Boru (Hedigan's) pubs, or, if you are not meeting at our starting point but in the old Village of Glasnevin, at the Botanic Gardens Café/ Restaurant or McMahons of Botanic Avenue, an atmospheric bakery/ coffee shop.